Despite overwhelming concern for fuel supply and costs, most airlines surveyed by a joint CIT/Forbes study indicated that they are likely to take a wait-and-see approach to how the next generation aircraft perform before making a commitment. CIT Transportation Finance President Jeff Knittel discussed the survey during a recent media briefing at the International Society of Transport Aircraft Traders conference (ISTAT). 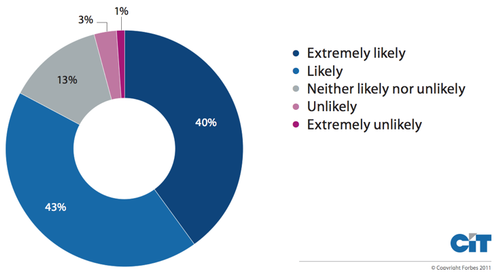 In the survey, 68% of those surveyed said they would wait and see how new aircraft perform while 32% would be the first to acquire or lease the new aircraft. Although not cited in the survey, among that 32% will likely be Southwest CEO Gary Kelly, who told attendees at the recent JR Morgan Aviation, Transportation and Military conference that he is anxious for Boeing to take a position. The survey results suggests that perhaps Boeing is right waiting to deliver more than just new engines to the market, despite the fuel urgency. But during the JP Morgan conference Boeing CFO James Bell said it has yet to make up its mind as to whether or not it will re-engine the B737, pretty much echoing what President James Albaugh told ISTAT. Even so, doubts about re-engining were high at ISTAT as GECAS CEO Norman Liu pushed the fact that putting a larger fan on the B737 is impossible without a lot of other major modifications. The big question, according to Mr Bell, is whether Boeing will be able to deliver the “big step change improvement” airlines are seeking. “The constraint for us is the innovation we need to have for a completely new aircraft,” he said, adding the company is selling all the 737NGs it can build. For now, it is looking into how else it can improve the B737 to equal the neo’s promises. He noted that offering more than one engine helps competitiveness but it is too early for a decision yet. 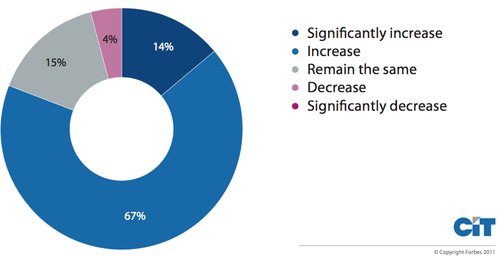 Interestingly, in the CIT/Forbes study, the vast majority – 83% – indicated they were extremely likely or likely to acquire or lease newer, fuel-efficient aircraft within the next five years. How likely are you to acquire or lease newer, fuel-efficient aircraft within the next five years? 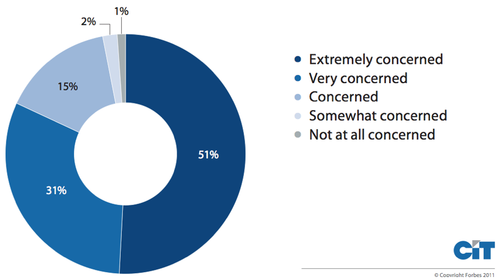 In the CIT/Forbes survey 51% indicated they were extremely concerned by fuel supply and costs with another 31% ticking "very concerned". Recently, the Air Transport Association sent another letter urging the Commodity Futures Trading Commission to adopt stiff new rules intended by Congress to curb commodity speculation. The organiation is seeking support for its email campaign to CFTC. 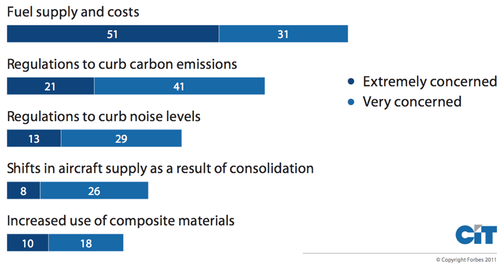 Concerns over composite materials, regulations and aircraft supply shift took a back seat to fuel supply and costs and carbon emission regulations, both of which will drive sales more than the other factors. How concerned is your business about the following aircraft-related issues? How important are the following sources of aircraft financing to your company? Complicating the picture is the trend toward consolidation which, according to the survey is far from over with 81% indicating they expected consolidation to increase or significantly increase over the next five years. or decrease over the next five years? As with its leasing counterparts, CIT is focussing on the narrowbody having ordered B737-900ERs among the 100 aircraft it has on order. On the widebody side, it has also ordered seven A350s and 10 B787s which are now scheduled for 2015 delivery. He confirmed what most leasing companies at the ISTAT conference suggested, taking delivery later in the production cycle is better, and CIT is after the first 100 off the production line. Mr Knittel expressed excitement at the aircraft as a game changer, concluding, “Sometimes the pain gets you the gain.” In response to a question, he acknowledged that it was not surprising, given the economy, that there was not as much push back on delays as there otherwise would have been. He suggested there was not only growth but growing optimism in the industry although the US would concentrate more on fleet replacement while the growth will be outside of the US in emerging markets, especially China. He pointed to the number of airports being built in China and Asia. CIT’s concern about the future of the neo largely hinges on what Boeing will do with the B737. Mr Knittel believes there are three possible directions Boeing might go. Boeing could re-engine the B737 with the same or similar engine technology as the A320neo or launch an all-new replacement aircraft – which also would have the same engine as the neo but an optimised airframe. The third possibility that Mr Knittel suggests is that CFM, the engine supplier to the 737, could incorporate many of the technological advancements that are already available into the existing CFM56-7 engine used on the B737 today. Although this third alternative of upgrading the existing engine would not have the same efficiencies as an all-new engine, it could provide enough of an improvement to keep the 737 slightly ahead of the A320neo and has other side benefits, according to Mr Knittel. First, it is a much less expensive option for Boeing than a new engine or new airframe, which would translate into lower cost of ownership. Second, the improvements could be accomplished and available earlier than the neo – perhaps as early as 2013. Third, it would buy time for Boeing to launch an all new aircraft and develop further engine improvements that will come in the future. Lastly, it would have a much less dramatic impact on residual values – a concern for all owners, lessors and airlines alike. He would not commit to buying or recommending the CSeries, punting instead, saying he would have to understand the depth of demand. It was clear during the ISTAT conference that the lack of A319neo orders was a concern. Then he said something very interesting with respect to the Chinese C919. He noted that the Chinese have been investing in a lot of countries all over the world which has created a lot of opportunity for them. It was clear during the ISTAT conference that there would be not Boeing offering to replace the 757 which needs replacement, according to operators. Speaking before the JP Morgan Aviation, Transportation and Defence conference last year, Airbus Americas President Barry Eccleston indicated the company is anxious to bring the NEO to market in 2015. He sees the A321neo, the first to hit the market now scheduled for 2016, as a 757 replacement. He also sees the A321neo as the company’s answer to winning over Boeing 737 customers depending on what Boeing ultimately decides to do. However, the company, said Mr Eccleston, has yet to identify all the resources necessary to bring the A321neo to the market a year ahead of schedule, he told investors. He noted the 332 orders and memoranda of understanding for the neo family in only three months since the company announced plans to re-engine the aircraft. It is projecting sales of 4000 neos making the business case even more compelling considering the investment needed to bring it off. Further goosing Boeing, Mr Eccleston added the A321neo's fuel efficiency is less than half the B737-900 or 900ER. Of course Boeing's James Bell, at the same conference disagreed, saying the B737 currently has a fuel advantage over the A320neo and whatever decision it made, would put the B737 and A320neo on par. Mr Eccleston also plugged the fact that the current A321 is already 14% more fuel efficient per seat than the B757 with almost as many passengers and, with sharklets, will increase that advantage to 17%. Given the length of time before biofuels make a dent, the differing philosophies amongst the manufacturers will make a big difference. It is clear Bombardier and Airbus have made their bets. However, Boeing and Embraer remained largely silent on in their deliberations.